Themed and classic tie clips and tie pins for young and old. Some of our tie clips have a country theme or novelty theme whilst others vary from plain classic to flamboyant to suit all tastes. A neat, treble clef on a silver tie clip with single diamanté contained within. A beautiful accessory for musicians and music lovers. Smart silver tie clip with blue and white sailing yacht. Matching cufflinks available. Lovely gift for men who love yachting. A smart gundog tie clip bearing the famous Stratton brand name. This item is exclusive to Elegant Extras. Also available as a stock pin. 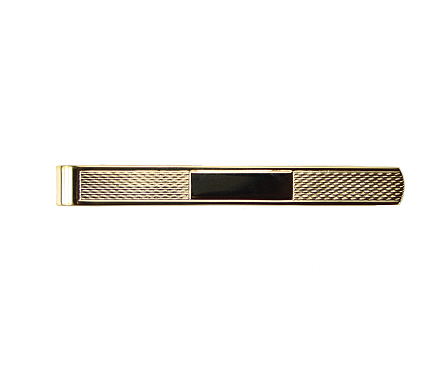 A gold plated barley twist tie bar with plain centre that can be used for engraving. Boxed. A very special tie slide. 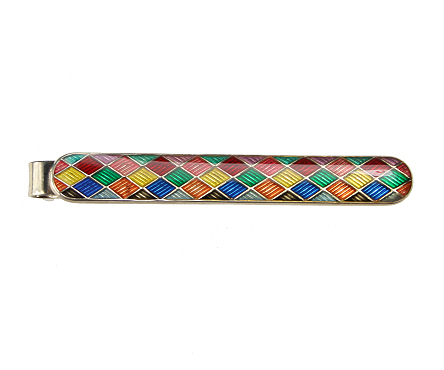 With a harlequin pattern set on a hallmarked sterling silver fitment this accessory is set to impress! Boxed.